This new trend is what experts term ‘The Experience Economy’ and anticipation over a planned trip can be just as exciting as the experience itself. The feeling of happiness lingers on after the trip in memories of course, but also increasingly through sharing via social media. I’ve been Champing™ on a number of occasions with different groups, including colleagues, my family and journalists. When Champing™ on press visits with people I didn’t know very well, we all agreed afterwards that we’d shared something unique. A most memorable experience was staying at The Church of St Cyriac & St Julitta, Swaffham Prior in Cambridgeshire, where colleagues and I were tasked with making a recording of our stay for BBC Radio 4. 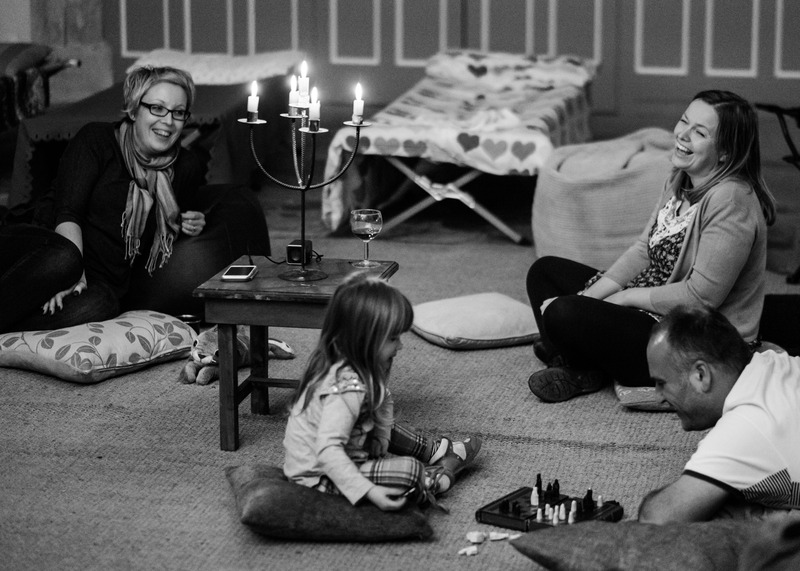 We thought that this would be fine, until we came back to the church to play board games and tell spooky stories after enjoying the local pub. I think the editor saw the funny side when she had to trawl through the hours of recordings of stifled giggles as we tried to record the required sound effects. You can listen to the final (edited) version here. Champing with a group is a unique experience and we’ve seen an increasing number of bookings for landmark birthdays, bucket list trips and anniversaries. My favourite was helping to plan a surprise 60th birthday party for a lovely lady’s husband. Her family came from far and wide to the gathering, which the husband knew nothing about until he arrived at the church! Engagement travel is a new phenomenon and Princess Eugenie getting engaged in Nicaragua shows a trend for couples seeking to make their marriage proposal as memorable as the big day itself! We’ve had at least one marriage proposal on a Champing™ trip – and, yes, she did say ‘yes’! The summer holidays provide the perfect opportunity for extended family groups to get together to do something different or to try out outdoor activities such as cycling, walking or canoeing. My son described our Champing trip™ as ‘totally epic’ and likened it to staying in a castle and our dog was delighted with the extra-long walk that he got! Don’t forget that Champing™ is exclusive to your group, so no sharing with strangers, unless you consider some people in your group to be strange, but that’s not something we can help you with. Giving experiences instead of things has also become popular and we’ve seen an increase in Champing™ gift vouchers, especially before Christmas when, lets face it, we’re all looking for the perfect gift to give the person who has everything. As for me, I’m planning my next trip with some of my colleagues, which will involve some work, but also a trip to the local pub!